It is not easy to purchase a gift for a child. This day and age they seem to be into a very specific thing and by the time you learn about it and get it, the craze is already over. Was over for months. And on this subject, is Frozen still a thing? But what I have learned is that kids love when they receive something unique, something nobody else has. And what better way to gift something unique than to make the gift yourself? Before you start panicking, let me reassure you, there are lots of possibilities out there that do not require you to sew like Coco Chanel. You don’t even have to have a sewing machine! Better yet, the little creatures require few materials and are ready in a couple of hours. One that I would highly recommend for a small child, toddler is the sock monkey (read my post here), for which you’ll find the tutorial on the Craft Passion website. If your child loves tiny creatures, then a little mouse ornament is the perfect gift (read my post here). The pattern can be found on Ann Wood’s website. 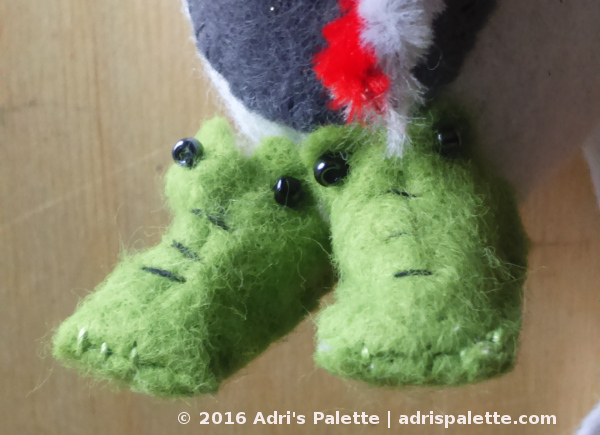 And if you fancy some alligator slippers to go, you’ll find the pattern on my Printables page. This time around I thought I’d try something else. If you’ve been reading my blog for some time you might remember Scrummage. Honestly, ever since I made him, I’ve been thinking about making another one. But this time around making it properly: with tin house and all. Trouble is, the pattern calls for an Altoids tin box and as far as I know it is not sold in my country. But lo and behold I found one similar! 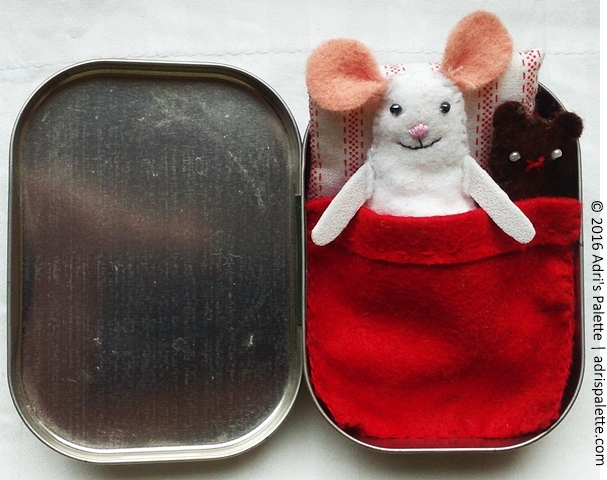 OK, it is a tiny bit smaller, but I had only to adjust the measurements of Larissa Holland’s original pattern a bit to accommodate my little mouse to her new home. 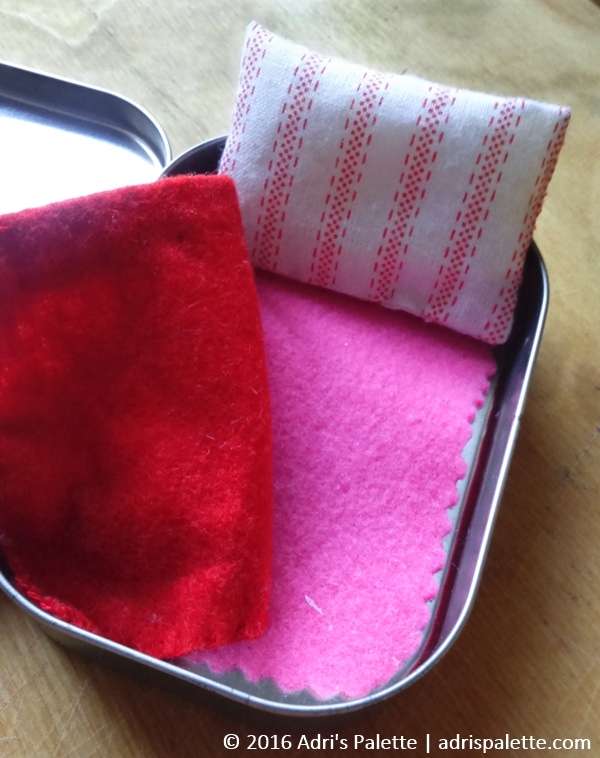 The little tin box has a lovely set of felt sheets and a cotton pillow in matching colors. Jó éjt! – Good night! 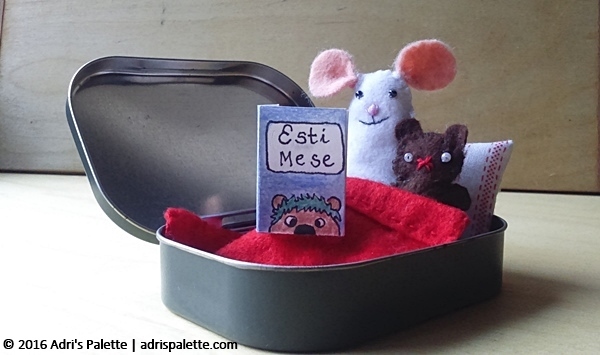 As I was looking around on Larissa’s website I spotted a tiny little book she designed to go with one of her mice. As far as I can see the original one (see it here) was made digitally. Now I don’t have that technology myself, and I wanted a bit of a challenge, so I drew it by hand. 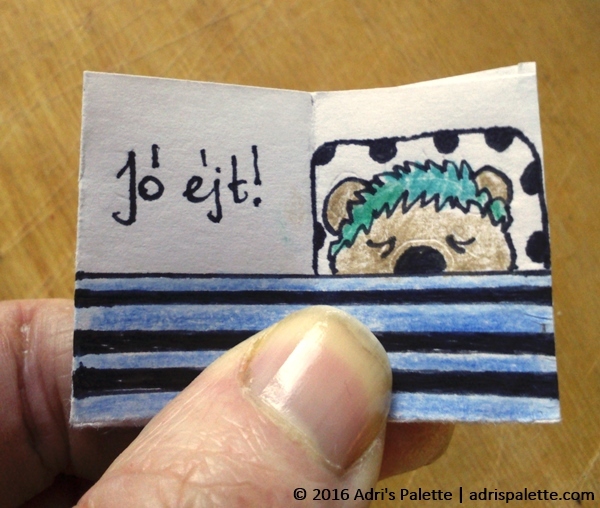 The drawing was not that hard on this scale, but the writing… At the end I did manage to write a little rhyme that fit right onto its tiny little pages. And here comes the issue. In the storybook I named the little teddy Raspberry. But then as we were thinking about it with Mr. AP we renamed her Hjorton (Swedish for cloudberry) in memory of an incredible jam we bought in Sweden last summer. And then suddenly it occurred to us, that jam goes really well with a crumble. So Hjorton and Crumble were born. So what’s the trouble with that, you might be asking? Well, since we already named them, they became family. And if they are family, we have to keep them. And now the issue is I’ll have to think of something else to make for that special someone!